Universal Studios Japan (ユニバーサル・スタジオ・ジャパン, Yunibāsaru Sutajio Japan), located in Osaka, is one of four Universal Studios theme parks, owned and operated by USJ Co., Ltd., which is wholly owned by NBCUniversal (as of 2017). The park is similar to the Universal Orlando Resort since it also contains selected attractions from Universal Orlando Resort and Universal Studios Hollywood. The park opened on 31 March 2001. Over 11 million guests visited the park in its opening year, making it the world's fastest amusement park to have achieved the 10 million milestone at the time. Since then, Universal Studios Japan has had approximately 8 million visitors every year. Most visitors are Japanese tourists and tourists from other Asian countries such as South Korea. It is also very popular among Western tourists and expatriates. In 2005, Goldman Sachs became the largest shareholder in Universal Studios Japan. Various events were held in the year 2011 to celebrate the park's tenth anniversary, by which time a total of 88 million guests had cumulatively attended the park. There were 700,000 annual passport holders in June 2012 and in the 2012 fiscal year, 9.75 million guests visited the park. During the 2013 fiscal year, Universal Studios Japan received 10.5 million guests. Various factors contributed to this growth in 2013, including the opening of the backwards roller coaster "Hollywood Dream – The Ride: Backdrop" in March, and the "New Amazing Adventure of Spider-Man - The Ride 4K3D" in July, which installed new 4KHD technology, which proved to be popular among the younger generation. The family area "Universal Wonderland" which opened in March 2012 also attracted many families. Recent installments include limited-time attractions such as "Biohazard - The Real" and "Monster Hunter - The Real", both based on popular video game franchises, and "One Piece Premier Show", which is based on the popular anime series, providing attractions based on entertainment worldwide. On 15 July 2014, The Wizarding World of Harry Potter, a themed area based on the blockbuster Harry Potter film series, opened to the public. The popular ride The Harry Potter and the Forbidden Journey, located in The Wizarding World of Harry Potter, was revamped to play in 3D only 10 months after its opening as the first ride of its kind in the world. With a total investment of 45 billion yen, the addition of The Wizarding World of Harry Potter to the park is projected to have an economic ripple effect of 5 trillion 60 million yen over the next 10 years in Japan, and anticipates many visitors from both Japan and overseas. The attractions are arranged in nine areas of the park. A tenth area, The Wizarding World of Harry Potter, opened on 15 July 2014 with its flagship attraction, Harry Potter and the Forbidden Journey. The area was modeled on the areas of the same names at Universal Orlando and Universal Studios Hollywood. There are also attractions that are not in the U.S. and are unique to Universal Studios Japan, such as Black Lake and Hogwarts Express Photo Op. Based on the city of New York City, New York. Based on the city of San Francisco, California. Inspired by Steven Spielberg's blockbuster film franchise of the same name. Inspired by Illumination's Despicable Me franchise. Themed to Sanrio's Hello Kitty franchise. Based on children's television series Sesame Street. Based on Universal's 1995 film of the same name. Based on J.K. Rowling's original Harry Potter books and as well as Warner Bros.' hit film franchise. Universal Parks & Resorts announced a partnership with Nintendo in May 2015 to build new Nintendo-themed attractions. In March 2016, Universal Studios Japan and Nintendo announced that a new Nintendo-themed area is coming to the park in 2020, in time for the Tokyo 2020 Summer Olympics. ¥40 billion is being invested for the project (funded by Universal) and the area will feature many attractions themed on Mario, as well as other Nintendo characters. An eastern area of the park currently used for events was confirmed as being the new development's location. Motion Picture Magic - When the park first opened in 2001, the attraction 'Motion Picture Magic,' hosted by director Steven Spielberg, occupied the building that currently houses the attraction Sesame Street 4-D Movie Magic. The attraction, originally designed by experience designer Bob Rogers and the design team BRC Imagination Arts, provided a tribute to the Universal Studios brand of motion pictures. During the show, the theater transformed into a multi-screen presentation and when the show ended, the main screen raised to present a real motion picture set in which the audience would cross through as they continued through the attraction show building. E.T. Adventure has been replaced by Space Fantasy – The Ride. Monster Make-Up has been closed. Back to the Future - The Ride has been replaced by Despicable Me Minion Mayhem. The Wild Wild Wild West Stunt Show was a live stunt show based upon a wide variety of Universal's Western films. Opening on 31 March 2001, in the Western Town section of the park, the show featured several cowboy-themed actors surviving death-defying stunts, shootings and explosions. The show closed in 2006 and has since been replaced by Wicked. A former section at Universal Studios Japan, which was based on L. Frank Baum's Wizard of Oz book series. It was later replaced by Universal Wonderland section. In 2011, USJ's Christmas tree was recognized by the Guinness World Records as the most illuminated Christmas tree in the world having 260,498 lights. Universal CityWalk Osaka links Universal City Station with the park entrance. It is a 3-floor shopping mall filled with numerous shops and restaurants and a 10-Screen Movie Theater Cinema Complex, including a takoyaki museum. In November 2004, a 35-year-old woman from Osaka Prefecture suffered nerve damage in her right wrist, affecting the use of two of her fingers. This occurred when her hand got stuck in a safety bar of the E.T. attraction as an employee pulled it down to secure it. ^ "TEA/AECOM 2006 Global Attractions Report" (PDF). Themed Entertainment Association. 2006. Archived from the original (PDF) on May 13, 2013. Retrieved March 31, 2015. ^ "Universal Cool Japan 2016 - Osaka - Japan Travel - Tourism Guide, Japan Map and Trip Planner". JapanTravel. Retrieved 2016-03-14. ^ a b "Universal Studios Japan to Open Wizarding World of Harry Potter in July". Variety Media. Retrieved 2014-04-18. ^ "Harry Potter and the Forbidden Journey: Now in 3D". themeparkinsider. Retrieved 2015-05-20. ^ "Universal Studios Japan visitors top 100 million". Archived from the original on 2013-01-22. Retrieved 2 Nov 2012. ^ a b "GLOBAL ATTRACTIONS ATTENDANCE REPORT" (PDF). Themed Entertainment Association. 2015. Archived from the original (PDF) on June 26, 2015. Retrieved June 3, 2015. ^ "TICKETS". 2019. Archived from the original on January 29, 2019. Retrieved January 29, 2019. 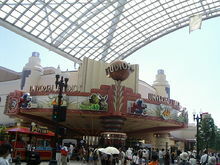 ^ "Universal Studios Japan Attraction/Studio Guide". usj.co.jp. Archived from the original on 2006-11-18. Retrieved 2006-11-19. ^ Fritz, Ben (9 May 2012). "Harry Potter heads to Universal Studios Japan". Los Angeles Times. Retrieved 10 May 2012. ^ "世界最高フライング・コースター【ザ・フライング・ダイナソー】 - USJ". 世界最高フライング・コースター【ザ・フライング・ダイナソー】 - USJ. ^ "Pushing our limits to bring more excitement than ever for our 15th anniversary! Dragon Quest: The Real — Realistic battles in a world of adventure, Minion Park — the world's largest*1 Minion area, and more!". Universal Studios Japan. December 26, 2016. Retrieved 18 February 2017. ^ Villas-Boas, Antonio (May 7, 2015). "Nintendo's huge new deal with Universal shows just how far it'll go to turn the ship around". Business Insider. Retrieved March 6, 2016. ^ Ashcraft, Biran (March 5, 2016). "First Details on Nintendo's Universal Studios Collaboration". Kotaku. Retrieved March 5, 2016. ^ "Universal Studios Japan - Motion Picture Magic" (PDF). BRC Imagination Arts. Archived from the original (PDF) on 2013-12-24. ^ "Universal Studios Japan: Universal Studios Motion Picture Magic" (PDF). BRC Imagination Arts. Archived from the original (PDF) on 2013-12-24. ^ Strother, Susan G. (12 July 1991). "Universal Kicks Off Western Show". Orlando Sentinel. Retrieved 11 July 2011. ^ "USJ theme park has continued to misuse explosives". Japan Weekly Monitor. 19 August 2002. Retrieved 11 July 2011. ^ "Quick Hits". Retrieved 2012-06-11. ^ "SCREAMSCAPE Presents - The 2001 Ultimate Awards". 2002-09-18. Retrieved 2012-06-05. ^ "The Theme Park Insider Awards". Retrieved 2012-06-05. ^ a b "Thea Recipients". Archived from the original on May 2, 2012. Retrieved 2012-06-05. ^ "14th Annual THEA Awards". Archived from the original on 2014-05-25. Retrieved 2012-06-05. ^ "IAAPA 2009 BIG E AWARDS". Retrieved 2012-06-05. ^ "IAAPA 2009 Big E Awards Recognize Top-Notch Live Entertainment in the Attractions Industry Europe, Japan, and United States Productions Stand Out in 2009". 2009-11-18. Archived from the original on 2010-04-23. ^ "TEA/AECOM 2008 Global Attractions Report" (PDF). Themed Entertainment Association. 2008. Retrieved November 20, 2012. ^ "TEA/AECOM 2009 Global Attractions Report" (PDF). Themed Entertainment Association. 2009. Archived from the original (PDF) on June 2, 2010. Retrieved November 20, 2012. ^ "TEA/AECOM 2010 Global Attractions Report" (PDF). Themed Entertainment Association. 2010. Archived from the original (PDF) on July 19, 2011. Retrieved November 20, 2012. ^ "TEA/AECOM 2011 Global Attractions Report" (PDF). Themed Entertainment Association. 2011. Archived from the original (PDF) on October 18, 2015. Retrieved November 20, 2012. ^ "2012 Theme Index-Global Attractions Attendance Report" (PDF). Archived from the original (PDF) on April 8, 2014. Retrieved 19 June 2013. ^ "TEA/AECOM 2013 Global Attractions Report" (PDF). Themed Entertainment Association. 2014. Archived from the original (PDF) on June 6, 2014. Retrieved June 6, 2014. ^ "2015 AECOM and TEA Theme and Museum Index Report" (PDF). AECOM. ^ "2016 AECOM and TEA Theme and Museum Index Report" (PDF). AECOM. ^ a b "2017 AECOM and TEA Theme and Museum Index Report" (PDF). AECOM. ^ "Universal CityWalk Osaka". Retrieved 2 November 2012. Wikimedia Commons has media related to Universal Studios Japan. This page was last edited on 13 April 2019, at 01:54 (UTC).